Could someone run a few laps around the ring in GT6 and let me know what times they can do in them? A curiosity of mine in any racing game that has the ring, is how fast the cars can go with their default settings. By that I mean not upgraded in any way, and with the default tires, or comforts. Also interested in other cars also, such as BRZ/GT86, AE86, Honda S2000 (all variants), Honda civics (EG and EK mainly), Mazda MX-5, RX-7, RX-8. Cars from tuner dealerships also included (Mines, HKS, and so on). I am still debating whether or not to get a PS3 and GT6 in the new year, even though I will get annoyed over the standard cars. I'd be more than glad to do this. Any particular setting preferences? Do you want the Pace Car and the tuner counterpart to that too, and do you want them with oil changes or no? Edit edit: This is asking for a lot You want to test close to 90 cars with this, there are like 30 MX5s and 25 Skylines and the other cars will add to about 30ish...Ah screw it I have nothing else to do. I'll start tomorrow. lol, it is just the normal road cars I am interested in. Obviously there is no point in testing the like for like models (i.e same chassis code, same engine, same weight and so on). So really for the MX-5 it would do Eunos, Miata, Gen 2). I am also only interested in the road legal cars, and no pace or race cars. 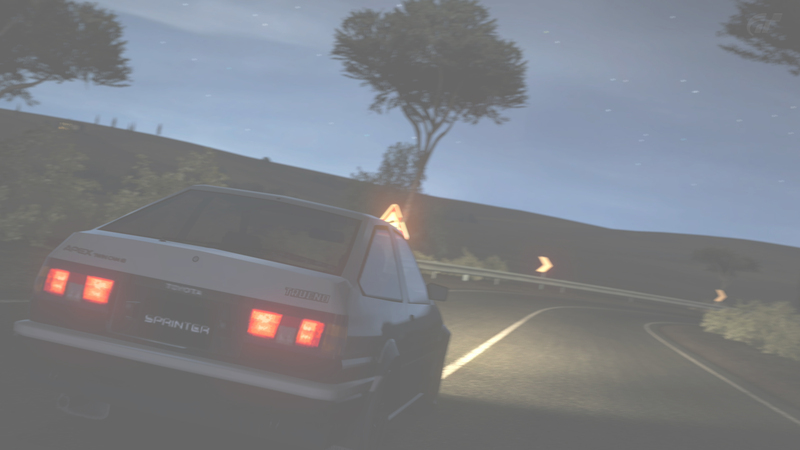 This is because I am only interested in the types of cars used for legal touge racing on here. Hey Ialyrn, I got you lap times from the Nissans you wanted. I ran out of credits so I couldn't get any of the other cars. Impressive work there didn't think anyone would get that much done. Nice. That was a solid 2 and a half hours of buying and driving. Thanks Obelisk for doing that, those are about what I expected in all fairness. They seem like good times, so I guess GT must be the game you excel on. When you have a few in game credits spare again, could you tune up the Sileighty? Very interested to see what that one is capable off, especially considering you managed to get that one 2 seconds faster then the 240sx. Also, doesn't GT still have the "arcade" mode (aka free run)? The free run mode is what I did all of that on. I did keep the Sileighty because racecar. It's a total mess...I can't keep it straight or turning correctly. I just tested it on RS tires, would have hit a 6:50 if I didn't screw up my brake balance. A majority of the people I see running online within the 430-500pp class go with the the s2k which I must say absorbs the bumps of the nürburgring quite well.